Hope After Faith is an interesting story of one man’s journey from faith to unbelief. 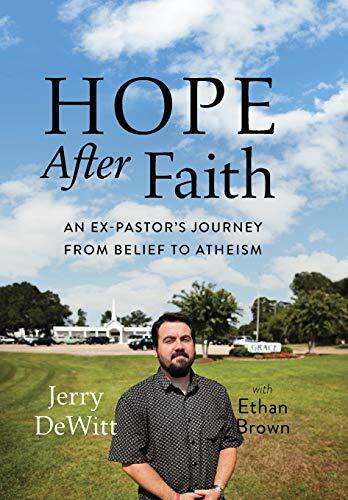 Raised in rural Louisiana and brought up in Pentecostal churches, Jerry DeWitt uncritically accepted a faith that was in large part rooted in his immediate environment. His journey in the ministry was convoluted and sad. He describes involvement with this Pentecostal group and that one, always on the fringes even of Pentecostal theology, not to mention other mainstream non-Pentecostal churches. Mr. DeWitt became convinced at the age of 17 that he was an evangelist—not a local pastor, but someone who travels and preaches to large crowds (in the same manner that Billy Graham does). Part of his growing frustration was the fact that he did not get much opportunity to do what he felt he was called to do. Perhaps this should have given him a hint that evangelism was not his calling. In his quest for greater involvement in what he felt he should be doing, author DeWitt attached himself from time to time to ministries led by men who may not have been the best examples of Christian leadership. Their theology would prove questionable and their personal lives led much to be desired in terms of commitment to others. Had Mr. DeWitt linked himself with responsible Christian mentors, much of his later disillusionment could have been avoided. Another issue that comes out in the book is Mr. DeWitt’s lack of knowledge of Pentecostalism. He often endorses interpretations of Scripture that are theologically unsound. One area that shows this lack of awareness is his frequent differentiation between the Assemblies of God and Pentecostal Christians. Mr. DeWitt leaves the distinct impression that he does not believe Assemblies of God churches to be Pentecostal. The truth is that the Assemblies of God denomination (currently one of the largest Pentecostal groups in the US) arose out of the 1906 Azusa Street revival in Los Angeles, California, that gave birth to the modern Pentecostal movement. In the rural South, Christianity is still a strong cultural force and rejection of the faith does have consequences. Friends no longer have common ground and foundations, his wife has been told that her values are being rejected—Mr. DeWitt has turned his back on an entire value system and way of life. There are a couple of audiences for this book that may not seem apparent. Pentecostal Christians should definitely read Hope After Faith. Mr. DeWitt’s descriptions of certain flavors of admittedly fringe Pentecostal theology serve as a warning to Pentecostals to study their Bibles and clarify their beliefs and practices. Much of Mr. DeWitt’s problems stemmed from his own Biblical illiteracy and undue emphasis on only certain passages of Scripture. The other group for which this book is a “must read” is church leadership—pastors and others who are involved in nurturing and developing the people in the congregation. One glaring lack in Mr. DeWitt’s life apparently was that he had no mature Christians to mentor him. There is little or no mention of others who were involved in his spiritual growth. In addition, if one is going to claim to possess a particular spiritual gift, that gift needs to be confirmed by others. A person does not just declare “I have the gift of evangelism” (or any other gift) and then leap into that task. Church leaders will help establish whether or not any gift is really present or not. Mr. DeWitt does not describe any such instance where what he believed was a spiritual gift was actually acknowledged and confirmed by church leaders. There is a special poignancy in the last chapter or so of the book. Mr. DeWitt talks about the meaning that Christianity brings to the lives of believers, even as he struggles to be “free.” One almost hopes that he will see that the humanist philosophy he seems to have found (even though it does not seem to go much further than “I am free to make my own decisions”) will not be the end of the road, but only a necessary side-trip in his life’s journey. True Christianity did not fail Jerry DeWitt—he never got to see it in action.